At Passionflower, we always love incorporating fruits and veggies into arrangements. We've used mushrooms, and apples, and carrots, cauliflower, artichokes, citrus of various kinds and a few weeks ago it was snow pea pods on the vine (so lovely I could hardly stand it). This week our friend Amy Daniel over at Fall Creek Nursery brought us these amazing blueberry bushes which she wanted us to cut and incorporate into floral designs. Hello big yummy. 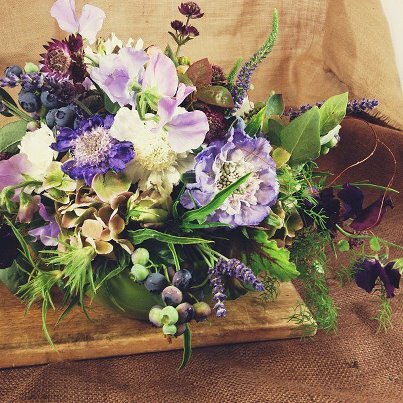 You could definitely graze on this lush and wild bouquet Sarah made. The deep blue of the blueberry is a color rarely found in nature. Come to think of it, where else do we really find that color in nature? the hair of certain dogs? some kinds of cabbages? maybe in some minerals? What is it about color that makes the world come alive?